Maybe retirement in May was really David Letterman’s Asian Pacific American Heritage Month tribute. That surely eclipsed Tom Hanks that night. 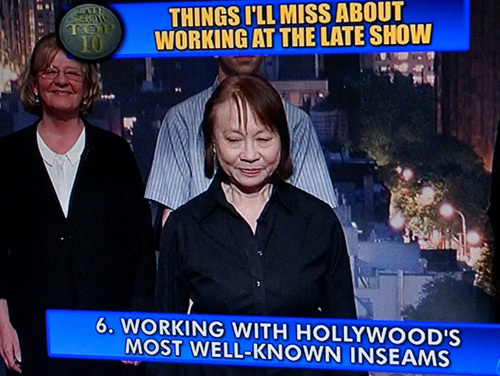 And on the second to last night, if you wondered who would be featured in that prized slot between the Top Ten List and the big guest Bill Murray, it was none other than Letterman’s go-to Asian regular guy, Rupert Jee of Hello Deli fame, a foil of Letterman’s since 1994. And then Letterman played a montage of Rupert’s greatest hits. But it’s this kind of thing that makes you love Letterman or leave him. It would be easy to see the Rupert bits as offensive, especially since it’s the Asian man doing stupid things while Letterman is telling him what to do via walkie talkie. For your entertainment, we get a remote control Rupert doing dumb things, such as putting pepper on a restaurant patron’s bread while acting as a waiter, and then serving her a glass of water with his finger in it. And then with rubber gloves. If you think of it as an Asian guy playing the White Man’s monkey, it’s super-offensive and paternalistic. And I admit to feeling a bit of that as I saw Rupert on the show through the years. But by the end of Tuesday’s montage, I also admit to laughing. And when I saw Rupert and Dave shake hands after, I could tell there was a lot more love at work than hate. Maybe even more of the prime virtues, silly and stupid, than anything else. Stunts that brothers would pull on each other. In the name of comedy. And besides, in exchange for all that, Rupert’s website and deli sell Late Show T-shirts. Less perishable than cold cuts, and now collectors’ items. The last Late Night has arrived. And maybe I’ve been in denial understanding what big a deal this really is. In our democracy, we don’t even let presidents stay more than eight years. We’ve let Letterman lead us to bed for 33. In an America where pop culture is king, the passing of the Late Show with David Letterman is like losing a major piece of comic infrastructure. Can you imagine Pittsburgh without its bridges? OK, how about San Francisco? Nor can I imagine a late night without a Letterman. Dave was our bridge to silly. But I actually liked him better in Charlie Rose mode, when he’d get ex-presidents like Bill Clinton to loosen up and tell the truth. But Letterman’s a comic, and it was bedtime, so silly was still the priority. Some would say with his stupid pet tricks and stupid human tricks, he elevated the stupid by making it a virtue. That was his style, to find comedy in all the places you wouldn’t. Like Rauschenberg’s “found art,” Letterman found the funny in places like his corner deli and the guy who ran it, who just happened to be Asian. I wondered what Letterman might find in retirement, which led me to Jerry Seinfeld’s segment on “Comedians in Cars Getting Coffee” from Dec. 2014. It gives you a glimpse of what Dave might do without Sue Hum and Rupert. And the rest of us. There’s also a great Letterman show clip at 7:35 in the “Comedians in Cars…” show that for the purposes of this column gives us another Asian connection. When you ask what the best witty rejoinder ever made by Letterman was in 33 years, the one that always seems to come up is when Chinese talk show host Yue-Sai Kan came on the show and bragged about all the strange food she’d eaten. “Have you ever had the hump of a camel?” she asked. “But I must say when I was younger, I was pretty good,” Letterman said, topping the guest with big laughs and applause. I actually remember the first Letterman show. I had just bought my first Mac with 512K of memory! I also remember the iced tea commercial on his show the other night, the one with the song “Tiny Bubbles” that was originally sung by an APA original named Don Ho. Letterman’s NBC days I knew a bit better, because I was a TV broadcaster then at the old KRON, the NBC affiliate in San Francisco, the second largest market on the West Coast. As the arts/entertainment/culture guy/movie critic, I got to interview Letterman once via satellite when he had some sort of prime time special on the Peacock. After one plug on the local news, he sent me a personal handwritten note, which was in vogue way before Jimmy Fallon started writing them. It was a nice touch from Letterman, a former TV weather guy in Indianapolis, who chucked all that local greatness to follow his Worldwide Pants dream. He’s lived it for 33 years–a bit more than a generation. That was Dave, late night’s funny boomer, who, with more than a week left in Asian Pacific American Heritage Month, figures it’s time to say goodbye.